Once a year or so, journalists from major news outlets travel to the Marshall Islands, a remote chain of volcanic islands and coral atolls in the Pacific Ocean, to report in panicked tones that the island nation is vanishing because of climate change. Their dispatches are often filled with raw emotion and suggest that residents are fleeing atolls swiftly sinking into the sea. Yet new research shows that this is not the entire—or even an accurate—picture. Acknowledging this doesn’t mean that global warming isn’t real, or that world leaders and scientists shouldn’t tackle the adverse effects of climate change, but hype and exaggeration serve no one. These are the same Pacific islands that Australia’s warmist PM, Malcolm Turnbull, has just granted USD $1,000,000,000 (One Thousand Million Dollars) to help stop a sea level rise that isn’t happening. Breathtaking insanity and a hubris that would make King Canute blush, ultimately defrauding Australian taxpayers of their hard-earned money. 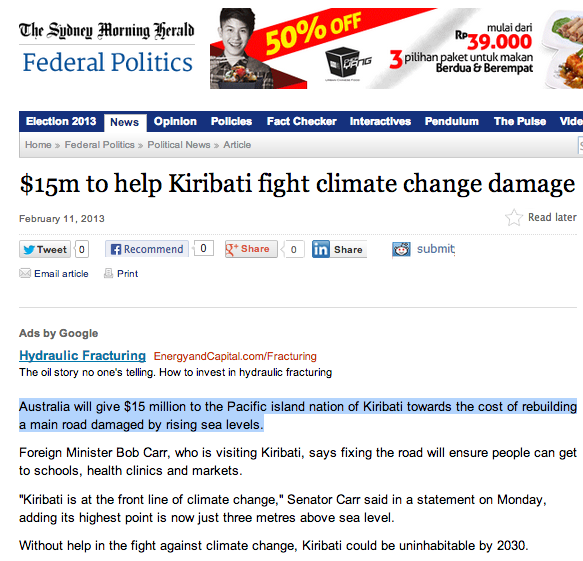 Did anyone in the Australian government google “Pacific Island sea-level rise data” before pledging a billion to the UN? Silly question. If someone in government had spent 10 minutes and 10 cents googling, they would have found no cause for concern at all. Climate Change, Climate Disruption, Global Warming or Global Weirding is not about science or the environment. It never was. MAJURO, Marshall Islands – A tense opening session of the 44th Pacific Islands Forum has been dominated by appeals from Pacific leaders for ‘real action’ against the threat of rising sea levels associated with climate change. Since the end of the last ice age, The Marshall Islands have survived 130 metres of sea-level rise, but the last 1.43mm/year since 1950 is going to sink them, therefore compensation must be paid for by Western nations! 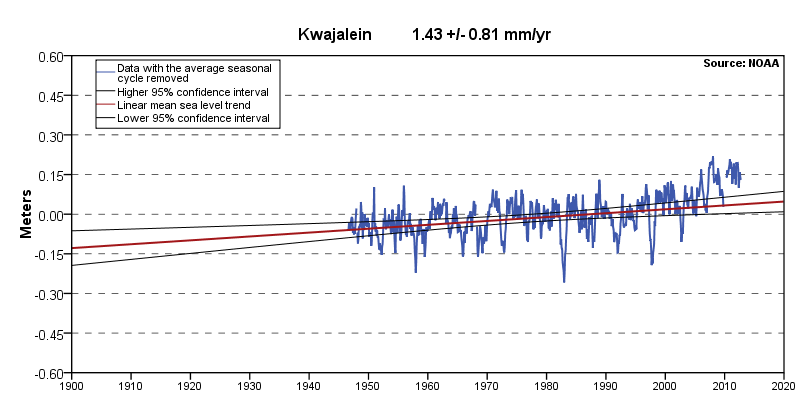 This is the sea level graph (from Kwajalein) recently being circulated and claimed to show an alarming acceleration of a proposed general sea level rise. Yes, this curve rises fairly rapidly from 1990 to 2012. But for what reason and with what regional message? 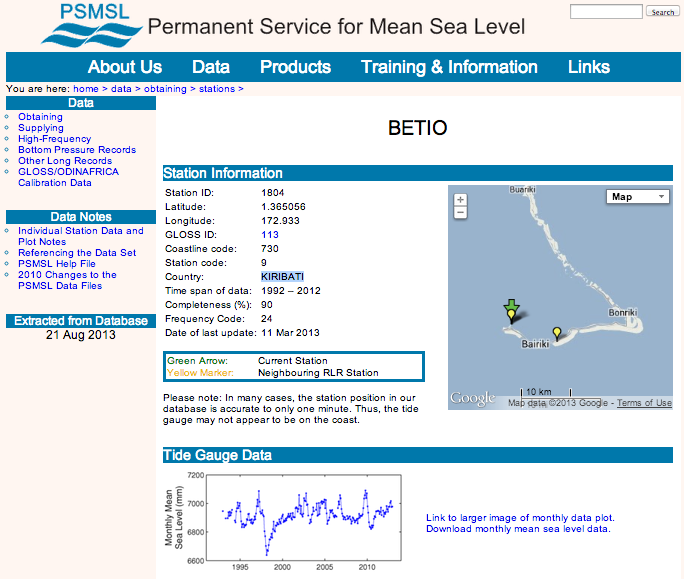 This is a sea level graph (from Majuro) and is shows a general sea level stability from 1992 to 2010. No traces of any acceleration! 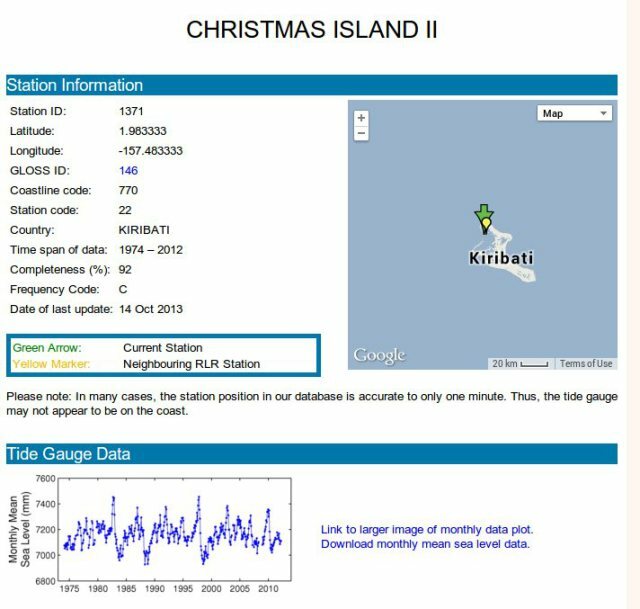 It looks like Kwajalein is affected by a local subsidence induced by building construction (or some sea level “correction” in order to have it going up). The Majuro records, for sure, contradicts and acceleration claim; even a general “rise”. In conclusion, don’t “hang your hat” on the Kwajalein graph. Look around and observe! Alarmist cries of rapid sea level rise and Pacific Islanders losing their homes are completely unsubstantiated by empirical evidence and peer-reviewed science. The catastrophic message essentially stems from statements by the thoroughly discredited Intergovernmental Panel on Climate Change (IPCC) and promoted vigorously by Governments pushing their own climate agenda and vested interests angling to cash in on climate guilt..
An Auckland University researcher has offered new hope to the myriad small island nations in the Pacific which have loudly complained their low-lying atolls will drown as global warming boosts sea levels. Geographer Associate Professor Paul Kench has measured 27 islands where local sea levels have risen 120mm – an average of 2mm a year – over the past 60 years, and found that just four had diminished in size. Working with Arthur Webb at the Fiji-based South Pacific Applied Geoscience Commission, Kench used historical aerial photographs and high-resolution satellite images to study changes in the land area of the islands. They found that the remaining 23 had either stayed the same or grown bigger, according to the research published in a scientific journal, Global and Planetary Change. “It has been thought that as the sea level goes up, islands will sit there and drown,” Prof Kench told the New Scientist. “But they won’t. 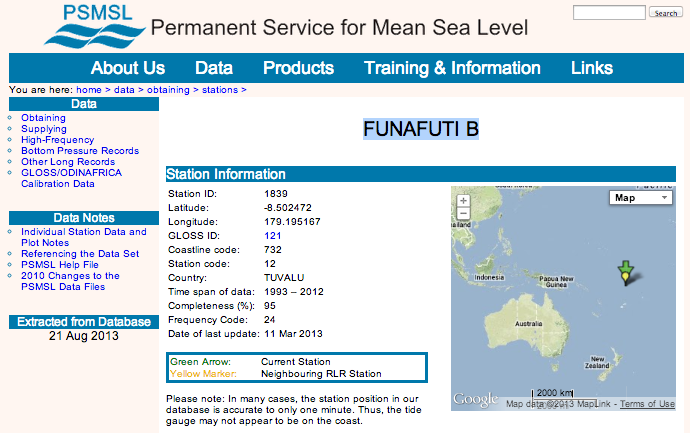 South Pacific Islands are not sinking. Claims they are due to global warming driven sea level rise are opportunistic. The purported plight of The Marshall Islands, Kiribati, Tuvalu and other Pacific Island nations serve merely as emotional arguments to promote Government and global climate agenda for carbon (dioxide) taxes, whilst cash-strapped Pacific Island nations use the associated climate guilt as a vehicle to pursue compensation to be paid by Western nations. Economic outcomes in line with the United Nation’s wealth redistribution agenda. 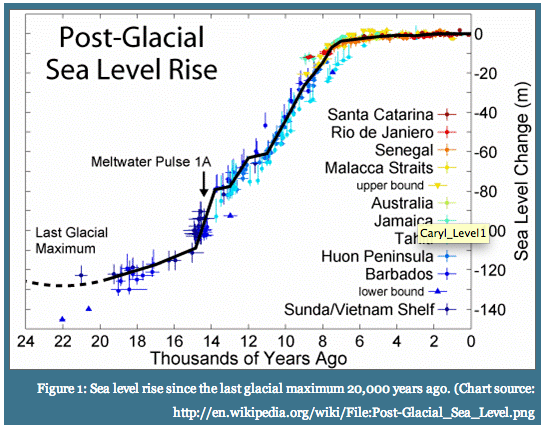 Read about the “Maldives” Sea-Level-Rise-Scam here. 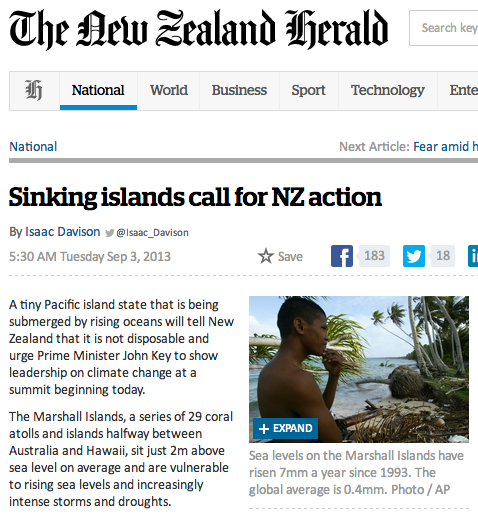 Two years has passed from first publishing this post, and there is still no sea-level rise in the Pacific islands that 40,000 COP21 Paris climate delegates and climate catastrophists assure you are “drowning”. AGENDA 21 : UN Wants To Ban Private Property And Create "Human Habitat Settlement Zones"